I know my life would have been better if my parents (and my stepparents) had kept this in mind. This needs to be tattooed on the eyelids of every single parent, whatever the relationship with the other half of the equation. I bent over backwards not to do this kind of thing. 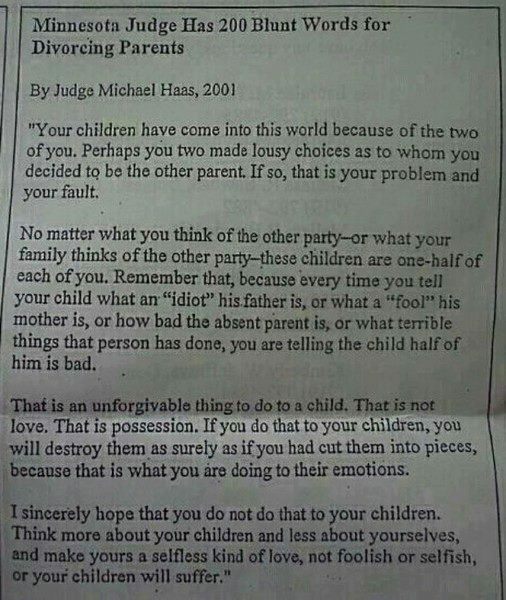 Does this still apply when the other parent is/was abusive, do you think? I think it is a delicate situation and the emphasis as you discuss it (since the child will need to) is that the behavior was wrong and hurtful. Don't turn it into "x parent is evil." Behavior is not identity and can be changed, new choices can be made. That way the child doesn't take on the idea that half of them is evil.